Within the span of one week, the Milwaukee Brewers had two pitchers make their Major League debuts by making quality starts. In fact, rookie hurlers Tyler Cravy and Taylor Jungmann joined a short list of pitchers who have put up some pretty impressive numbers in their first start in an MLB uniform. 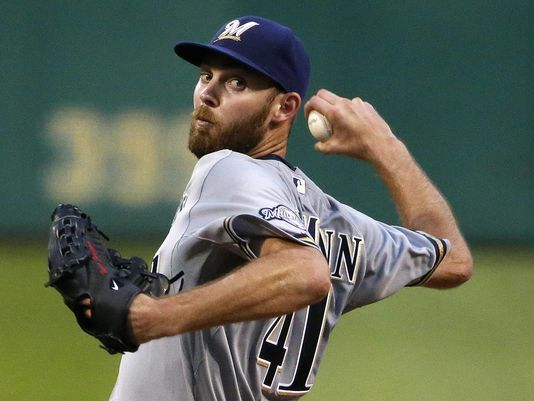 Cravy, starting June 2 against St. Louis, took the loss in the Brewers 1-0 defeat. He did, however, pitch seven innings allowing only four hits and giving up one earned run. Jungmann, starting June 9 against the Pirates, pitched an almost identical game to Cravy, although the Brewers won the contest 4-1. Jungmann got his first major league win by pitching seven innings, allowing only three hits and one earned run. Cravy and Jungmann became the 131st and 132nd starting pitchers in MLB history (since 1914) to pitch at least seven innings, allow less than five hits and give up one or no earned runs in their MLB debut. It was the fourth time it happened in the majors this season as Boston’s Eduardo Rodriguez (7.2 innings pitched, three hits and no earned runs)and Baltimore’s Mike Wright (7.1 innings pitched. four hits and no earned runs) achieved those numbers in their MLB debuts this season as starters. The Brewers became only the fourth team in MLB history to have two pitchers make their MLB debut as a starter with these numbers in the same season. In fact, with only one week separating Cravy’s and Jungmann’s performances, it was the shortest time between two such games by teammates in MLB history. The other teams that had two rookie starters reach these numbers in their debut in the same year: St. Louis (Michael Wacha and Tyler Lyons in 2013), San Diego (Brian Tollberg and Rodrigo Lopez in 2000) and Anaheim (Brian Cooper and Ramon Ortiz in 1999).